Are you learning wonderful life lessons with age? 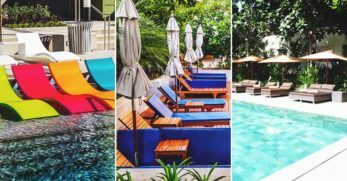 One huge lesson I’m learning right now is if you’re going to work hard, you must rest hard too. Otherwise, it’s all too easy to become burnt out. One way my family and I have tried to relax is by purchasing a pontoon boat. I love being out on the water and how relaxing it is. 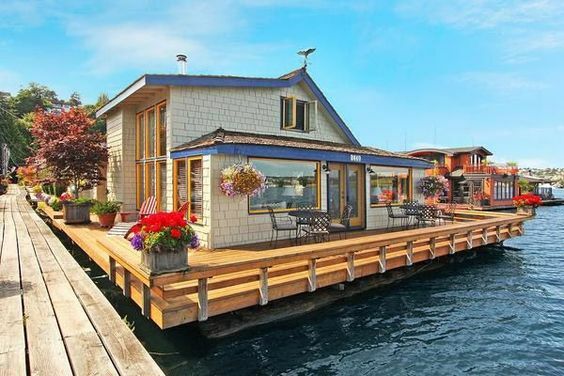 But did you know you can live on the water? 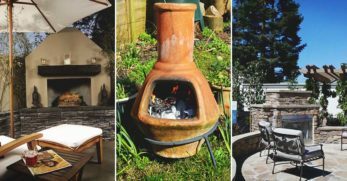 Whether you’re considering moving to a smaller home with less upkeep, or you’d like to have a vacation home, a houseboat could be the way to go. 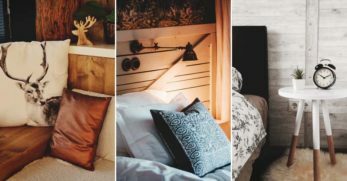 I’m going to share with you houseboat ideas and décor ideas to hopefully help you to become inspired. 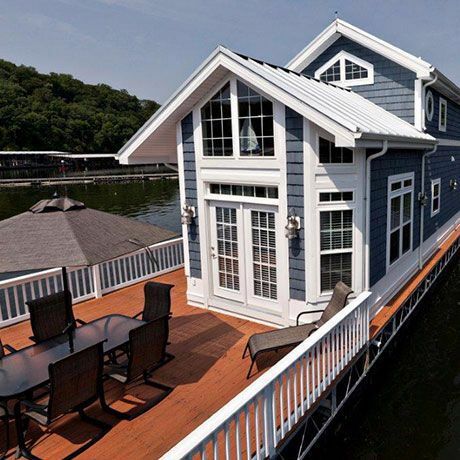 Imagine waking up in the comfort of a home which happens to be floating on the water. Truthfully, I wasn’t much of a boat person until we bought one a few months back. Now, I love being out on the water. 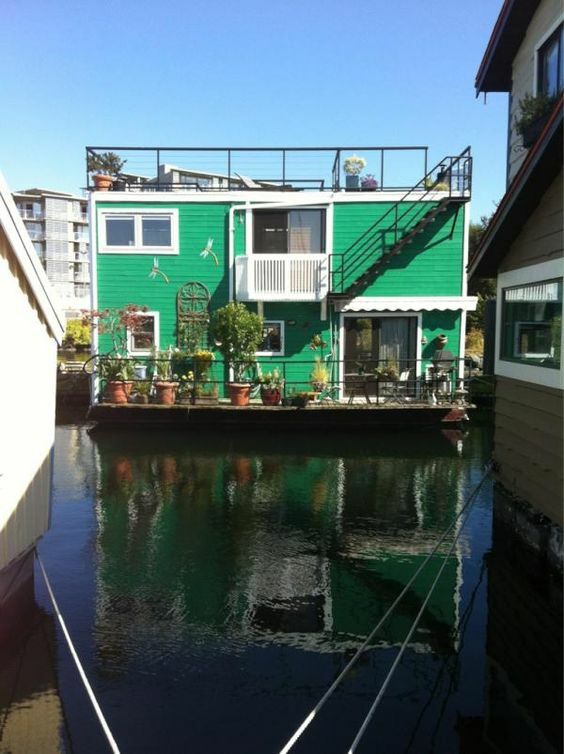 When I saw this houseboat, I knew I could most likely make the water my home. If you’d enjoy a floating home with a front porch and waterslide, this could be the home for you. This houseboat could be a more feasible idea for some because they took an older boat and recreated it. It may look a little retro on the outside, but the inside is up with the times. 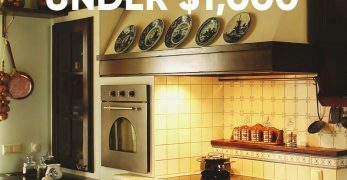 If you’d like to buy low and make it your own by remodeling, this could inspire you to make your dreams a reality. Some houseboats can be moved by trailer. 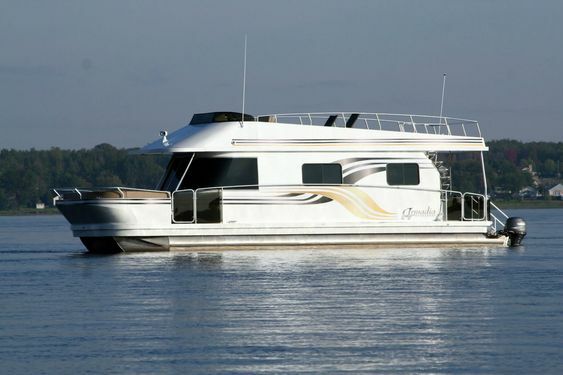 However, there are other houseboat designs where they must stay on the water because they’re too difficult to move. 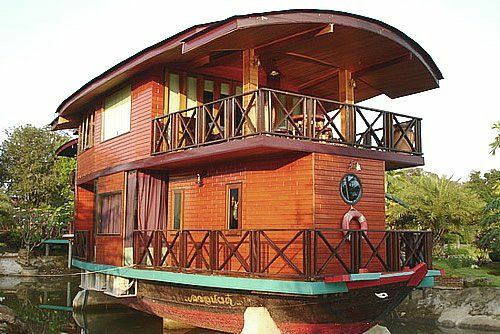 This houseboat is one which must stay on the water. When you see the design, you’ll understand it’s a literal modern home. The only difference is it floats on top of the water. 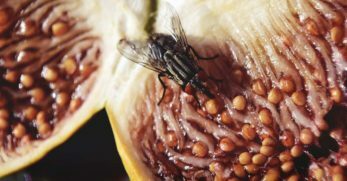 Have you ever seen the movie Sleepless in Seattle? 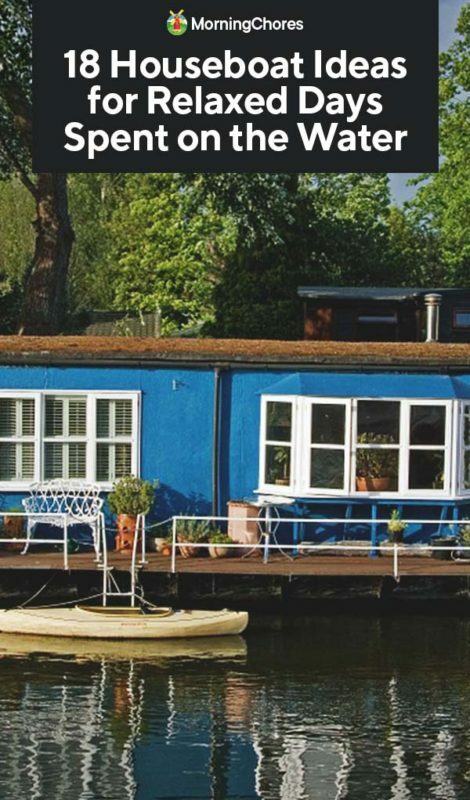 There was an iconic houseboat in the movie, and it has recently been sold. However, don’t let this bum you out. 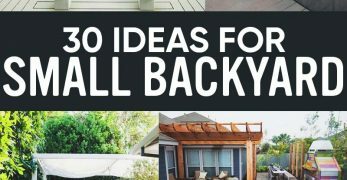 Instead, graze through these pictures and see if you can steal some inspiration for a future home on the water for yourself. 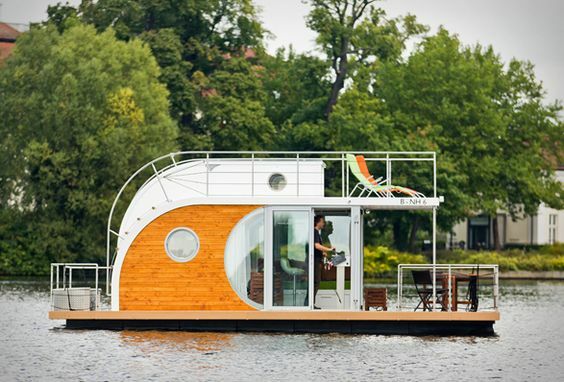 This is another modern houseboat. It’s a home floating on water. If you’d like to have more room but still be floating, this design could be great for you. 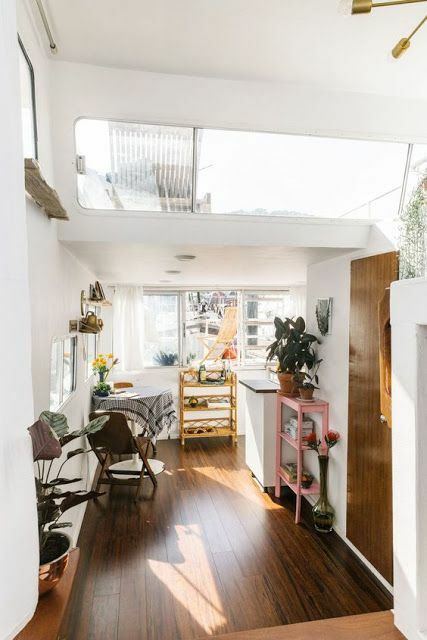 Plus, this houseboat has outdoor stairs which makes it perfect for taking in the views of your surroundings. 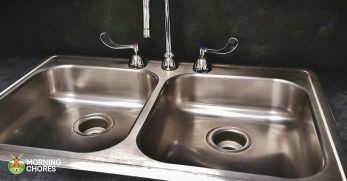 When you consider the idea of a kitchen on a boat, you may visualize a tiny galley kitchen with no décor about it at all. 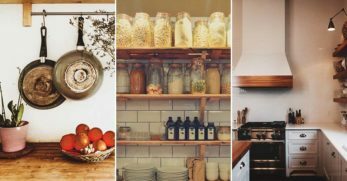 Well, this kitchen design idea could change this presumption for you. 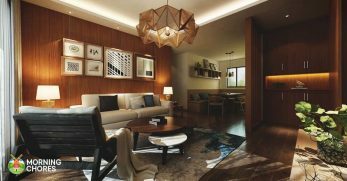 Instead, it offers an ‘at home’ feel with a burst of color and a modern touch. 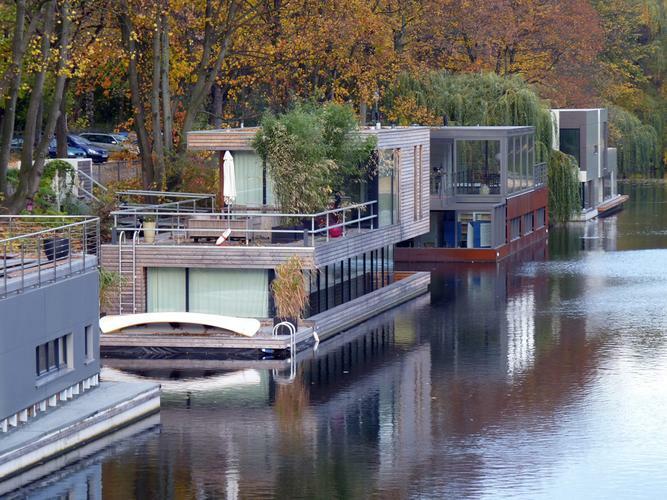 This a houseboat in Amsterdam. 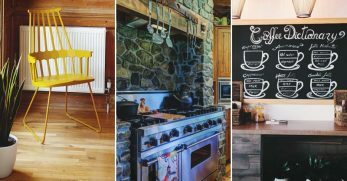 This couple created it and transformed the interior of their houseboat into a truly amazing place. It has a gorgeous modern design with wonderful views. 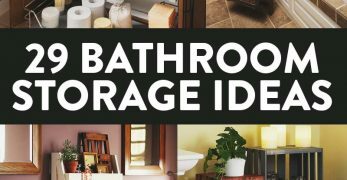 Granted, you may have to have a larger budget to make this one your dream, but nothing is impossible, right? 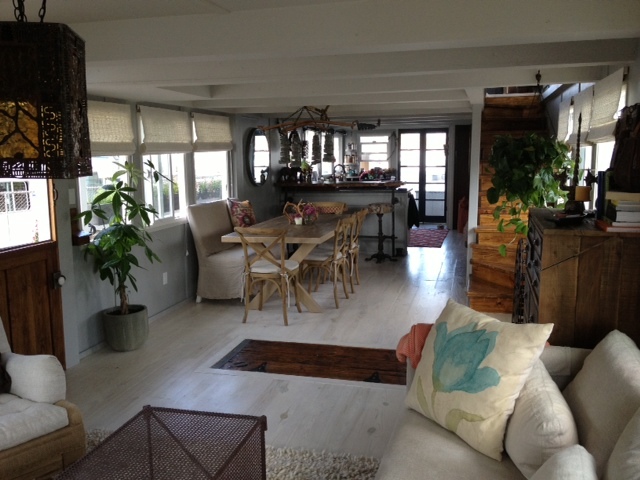 When you create a picture of an older houseboat in your mind, this may be what you envision. It appears to be built on a smaller ship. However, they built a monstrosity of a boat on top of this tiny ship. It also includes an all wooden balcony too. Houseboat living (no matter how large the boat you build on) is still tiny house living. This boat is going to be extremely tiny house living. However, if you can survive in extremely small quarters, go for it. You can purchase the plans to build this home yourself. 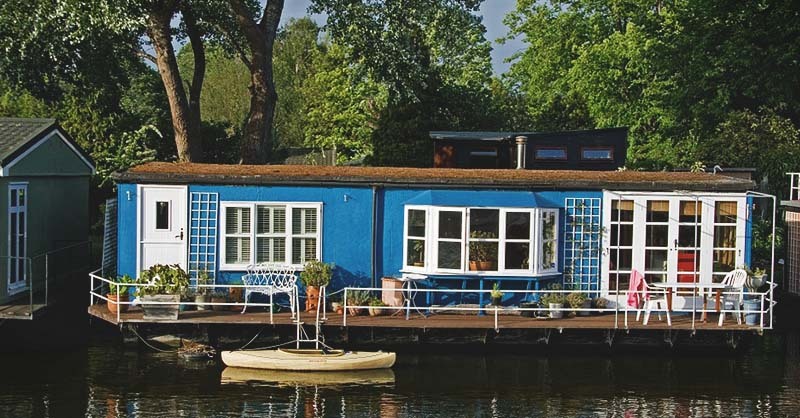 Are you concerned building a houseboat could be too much for you? 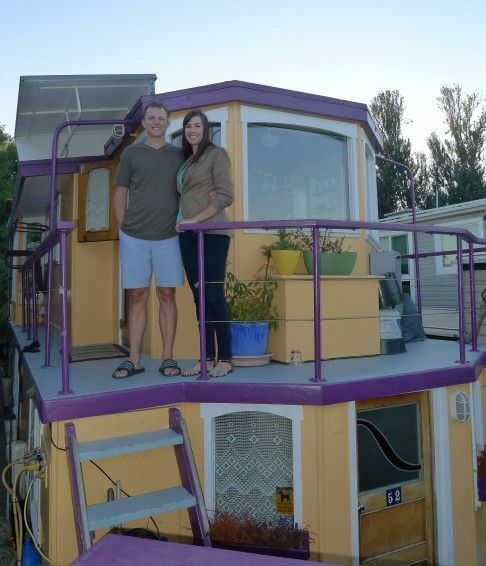 Well, check out this person’s adventure to building their simple but functional houseboat. They walk you through each step of the process and offer plenty of pictures too. 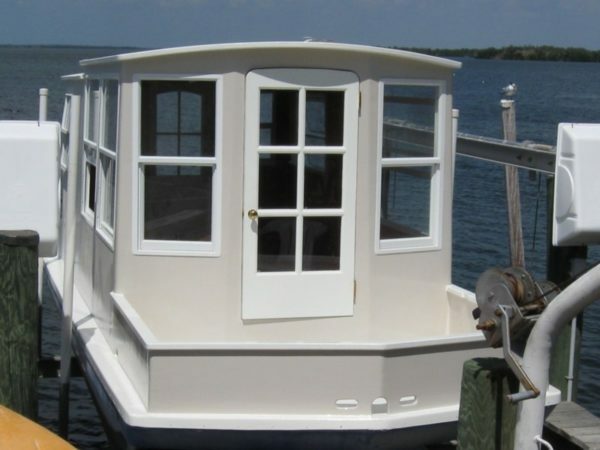 No doubt building a houseboat is a great deal of work, but you may be surprised of what you’re capable of. 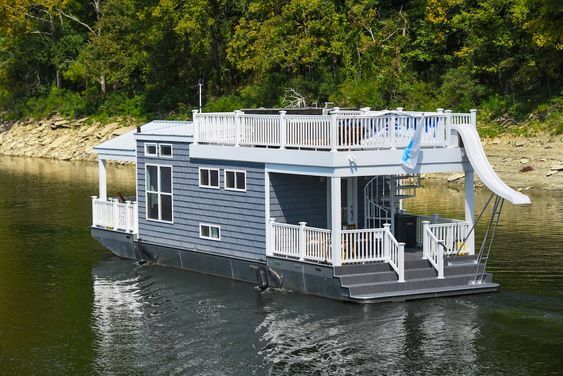 Maybe this houseboat isn’t quite as tiny as you’d imagined when I said ‘tiny house.’ However, it’s still an awesome option for a houseboat. This is a two-story boat with a modern feel to it. 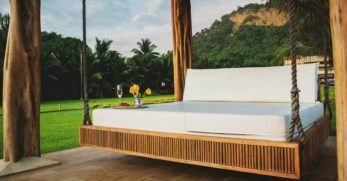 It would be a gorgeous way to take in all the views around you. 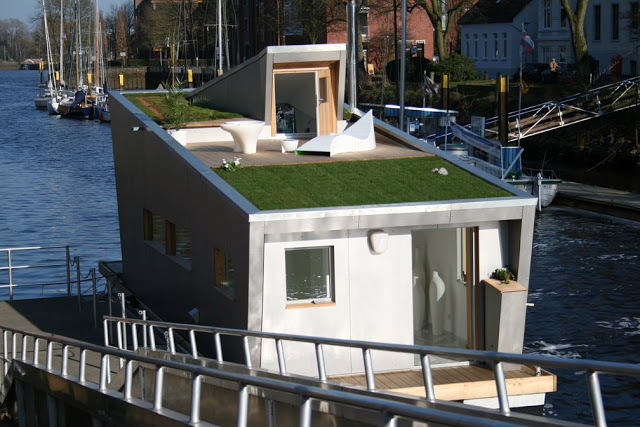 This houseboat is modern yet simple. It offers a single living space with a deck surrounding said living space. However, it also offers a top deck too. Imagine climbing the steps to enjoy a cup of coffee and the sunrise or a cup of tea with the sunset. 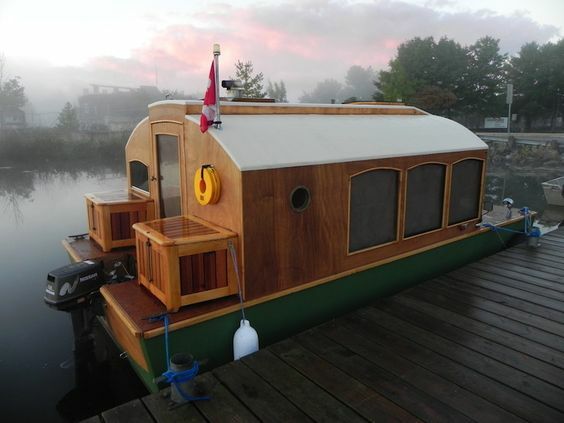 If you’re not a DIY person, you might be interested in this option for a houseboat. This particular one is for sale as I write this. 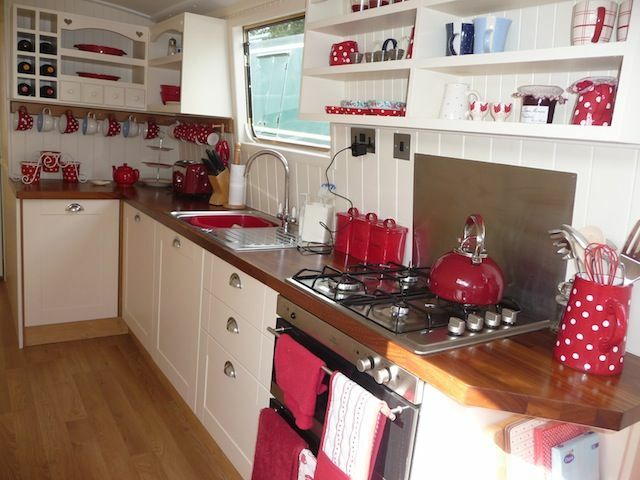 This is what a normal houseboat looks like. 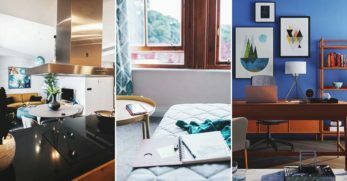 As you can see, they can be expensive, would be slightly larger than some tiny homes, but offer you a mobile life on the water with less square footage to keep up with than a typical home. 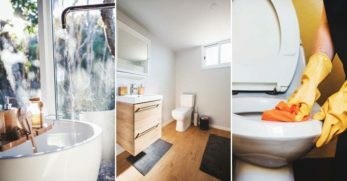 If you decide to build a tiny houseboat on the water, you may want some inspiration on how the interior could be laid out and decorated. 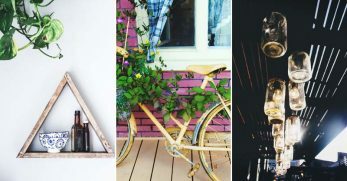 Well, this is one possibility to inspire your tiny houseboat décor. It’s a gorgeous modern look which is fun too. This couple took a 1980’s boat, traded in their larger home (and mortgage), and went to work making the old boat their new home. 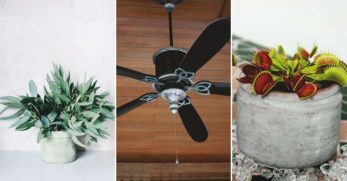 You can browse through and see all the ways they updated this home and added their own personal touch to it. 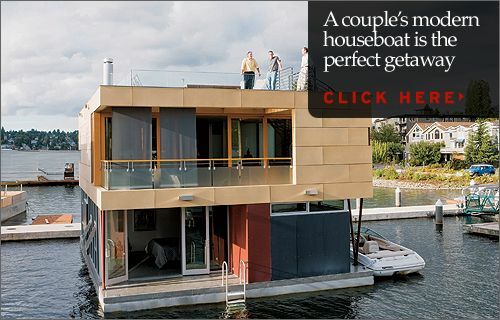 This is a particular brand of houseboat where they’re built to be a more modern and rounded design. It would certainly be a cool experience living in this style of boat. Not only do you have the stairs in the back to take it all in from the top deck, but you also have an open floor plan which would make boat living easier. 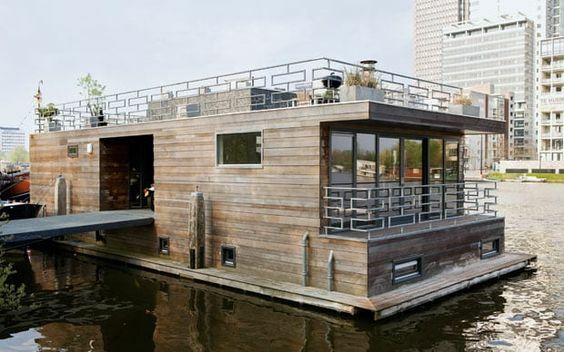 Another moment of honesty, if I could build any houseboat, this would be one of my top picks. 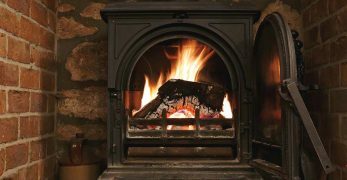 It has a gorgeous cottage design. But it’s also surrounded by a large deck. This home has room for gatherings indoor and out. It would be an excellent way to enjoy life on the water. One of the bonuses of living on a houseboat is there’s less to maintain as far as land goes. But what if you’d like to grow something? Well, this houseboat has you covered. They used a green roof. This way when you miss grass, you can stroll to the top of the boat. There you have it! 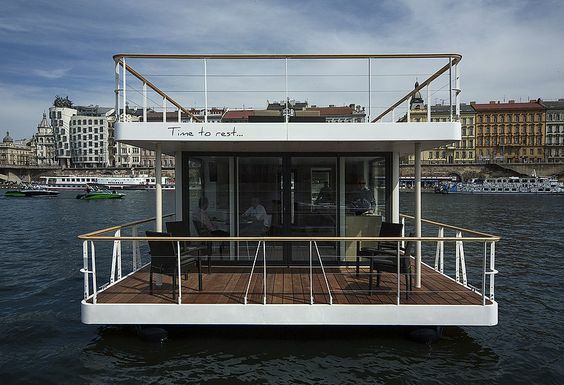 18 different houseboat ideas for both interior and exterior. 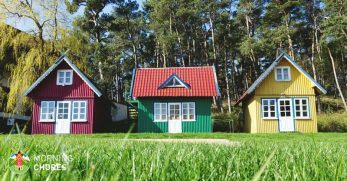 Houseboats could be a way for you to launch a downsizing effort, or it could be a great way for you to have a place to relax. 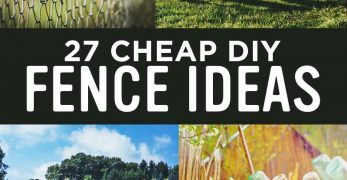 Either way, they’re fun to look at, dream about, and if it’s in the budget become inspired to make them a creation all our own.